(Nanowerk News) The Earth’s atmosphere contains oxygen because plants continuously produce it through photosynthesis. This abundant supply of oxygen allows life forms like animals to flourish. Therefore, oxygen had been thought to be an essential biomarker for life on extrasolar planets. But now, a research assistant professor Norio Narita of the Astrobiology Center of NINS, which was founded in April 2015, and an associate professor Shigeyuki Masaoka, of the Institute of Molecular Science of NINS, have presented a novel hypothesis that it could be possible for planets to have large quantities of abiotic (non-biologically produced) oxygen. This study is a good example of interdisciplinary studies that combine knowledge from different fields of science to promote astrobiology in the search for life on extrasolar planets. The study is published in Scientific Reports on Sep 10, 2015 ("Titania may produce abiotic oxygen atmospheres on habitable exoplanets"). 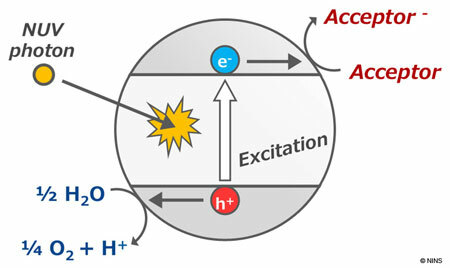 Photocatalytic Reaction of Titanium Oxide. Abiotic oxygen can be produced from water in the presence of titanium oxide and an electron acceptor under UV light. Our report suggests that this photocatalytic reaction can supply significant amount of abiotic oxygen on habitable extrasolar planets. Until now, it had been thought that if a planet has oxygen, that must mean that some form of plants are producing it through photosynthesis. Therefore, it had been assumed that when searching for signs of life on habitable extrasolar planets, the presence of oxygen in the atmosphere could be considered a definitive biomarker. However, non-biological chemical reactions can also affect atmospheric compositions of extrasolar planets. Now, the research team led by Dr. Narita has shown that, abiotic oxygen produced by the photocatalytic reaction of titanium oxide, which is known to be abundant on the surfaces of terrestrial planets, meteorolites, and the Moon in the Solar System, cannot be discounted. For a planet with an environment similar to the Sun-Earth system, continuous photocatalytic reaction of titanium oxide on about 0.05 % of the planetary surface could produce the amount of oxygen found in the current Earth’s atmosphere. In addition, the team estimated the amount of possible oxygen production for habitable planets around other types of host stars with various masses and temperatures. They found that even in the least efficient production case of a low-temperature star, the photocatalytic reaction of the titanium oxide on about 3% of the planetary surface could maintain this level of atmospheric oxygen through abiotic processes. In other words, it is possible that a habitable extrasolar planet could maintain an atmosphere with Earth-like oxygen, even without organisms to perform photosynthesis.